July 16, 2013, 10:21 a.m.
Defense One will deliver a daily mix of stories by award-winning journalists and useful, insightful commentary across the entire national security spectrum — from politics and procurement to global affairs and ground troops. Expect breaking analysis on the top news events of the day to run alongside deeper dives that shine a critical light on lesser-known facets of a national security world that most never see. Look for a range of voices from senior leaders in Washington to commanders abroad and next-generation thinkers far from the political scrum. — The design and UX don’t try to break ground as its big brother Quartz’s did, with a bold front-page-less, tablet-oriented approach. Defense One is attractive and reflows well on mobile devices, but it looks a lot like…a nice news site circa 2013. — Like Quartz, Defense One is editorially flat. I don’t mean that the content falls flat — I mean that the site’s structure isn’t larded up with blogs and verticals. It does feature what Baron calls channels (including one called “Threats”), but the layout of those channels seems to indicate that they’re more navigation tools than true verticals. That echoes the ongoing blog murder spree at the Times. — Initial advertisers (“sponsors” in Defense One lingo) include PricewaterhouseCoopers, Northrop Grumman, and AT&T, which pitches “Solutions for the warfighter.” Ad sizes are variable on article page sidebars — as small as 250px and as large as 1000px tall — and there’s a giant 940×470 slot at the bottom of each article and the front page. — Defense One launches with a total editorial staff of just three: exec ed Baron, associate editor/senior reporter Stephanie Gaskell, and digital producer/reporter Kedar Pavgi. But it also features a number of “regular contributors,” most notably Marc Ambinder, and I saw several bylines from Government Executive Media Group staff. “Defense One will continue to expand its staff and contributor team in a manner similar to Quartz, the recently launched Atlantic Media international business brand,” the press release says — which would imply pretty steady, incremental growth over time. — Also from the press release: “In addition to its digital presence, there will be an events component and research and print initiatives down the road.” Events will include a Defense One Summit this fall; it also promises “two groundbreaking editorial research projects, including an in-depth report on defense technology and a sweeping analysis on the future of defense, and a comprehensive e-book providing leaders with a compendium of must-read journalism on key defense topics heading into 2014.” Whatever events prospects Quartz has, you can probably double them for Defense One, where the community of readers is even more tightly defined, both by interest and by geography. Benton, Joshua. "A look at Defense One, Atlantic Media’s new site for the military-industrial complex." Nieman Journalism Lab. Nieman Foundation for Journalism at Harvard, 16 Jul. 2013. Web. 18 Apr. 2019. Benton, Joshua. "A look at Defense One, Atlantic Media’s new site for the military-industrial complex." Nieman Journalism Lab. Last modified July 16, 2013. 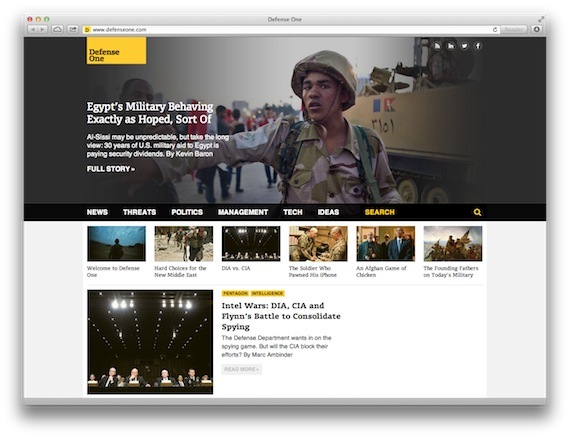 Accessed April 18, 2019. https://www.niemanlab.org/2013/07/a-look-at-defense-one-atlantic-medias-new-site-for-the-military-industrial-complex/.